Slovakia held the second round of voting in its presidential election on 29 March. The result saw the country’s prime minister, Robert Fico, defeated by an independent candidate, Andrej Kiska. Daniel Kral writes that Fico’s defeat was in part a function of the electorate’s fear that his party, Smer-SD, could come to dominate the country’s politics. Although Kiska now has a strong democratic mandate, he will nevertheless find it difficult to exert real power given his lack of support in parliament. On 15 and 29 March, Slovaks elected their new president in two rounds of voting. The final run-off between the country’s prime minister, Robert Fico, and an independent businessman and philanthropist, Andrej Kiska, ended with a spectacular victory for the latter. As a result, Slovakia shall, for the first time in its modern history, have a president who not only has never been a member of the Communist Party, but has never been a member of any political party in his life. Ultimately, Fico’s mantra of a politically stable Slovakia proved much less effective at mobilising support than the fear of his party, Smer-SD, dominating the country’s politics. Smer-SD currently forms Slovakia’s first one-party government since 1989, following overwhelming success at the 2012 Slovakian parliamentary elections. 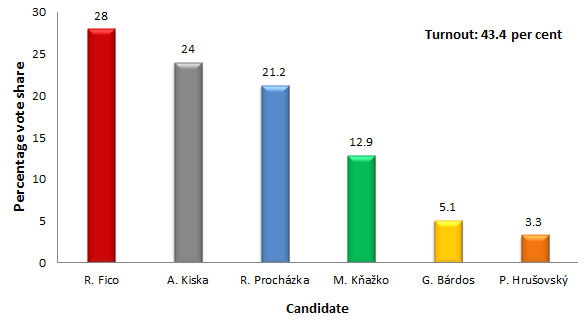 In the first round alone, around a third of Smer’s electorate did not turn up to vote. Indeed, as shown in Chart 1 below, it is possible that had the actor Milan Kňažko not chosen to run, Fico may have failed to even qualify for the second round. Kňažko draws his support from the same section of the electorate as the second and third placed candidates in the first round, Kiska and Radoslav Procházka. The outcome of the first round was deeply worrying for Slovak political parties in general. The second, third and fourth most popular candidates, together commanding almost 60 per cent of the vote, were all non-partisans. After receiving just over 3 per cent of support, the joint candidate of the parliamentary centre-right parties, Pavol Hrušovský, represented perhaps the biggest fiasco. On the other hand, Procházka, a young legal expert, ended up with twice the support predicted in polls prior to the election. Although falling short of the second round, Procházka declared his intention shortly afterwards to build a new centre-right party from the bottom up, relinquishing his parliamentary mandate and aiming for success in the autumn local elections. Despite coming first, Fico, the supposed strongman of the election, ended up entering the second round from a much less secure position than he had anticipated. On the other hand, Kiska, the ‘political outsider’, had successfully pursued a long and intensive campaign. With good reason to believe that a large proportion of the voters for the other independent candidates would back him in the second round, Kiska emerged as the clear favourite ahead of the final run-off. With an overall turnout of just over 43 per cent, Fico’s only hope lay in mobilising his supporters more effectively and deterring those of his rival. From Fico’s perspective, only one tactic lent itself to this purpose: attempting to completely destroy Kiska’s public profile. Particularly in the televised debates, Fico condemned Kiska’s consumer credit companies for immoral loan practices, claimed that he had misused his charity for political purposes, and even accused him of dabbling with Scientology. On the political level, Kiska was criticised for his lack of experience, with Fico citing the escalating situation in Slovakia’s eastern neighbour, Ukraine, and Kiska’s support for an independent Kosovo as key areas of concern. While Kiska was mainly on the defensive, he nevertheless invoked some scandals involving Fico’s previous government and accused his rival of trying to renege on promises he gave to the electorate at the 2012 parliamentary election. As it transpired, the slightly higher turn-out in the second round was not to Fico’s advantage. With almost 60 per cent of the vote, Kiska not only won, but completely crushed his opponent. Fico failed to either mobilise his supporters or deter the electorate from backing Kiska, with voters, perhaps put off by the prime minister’s confrontational rhetoric, choosing to side with the apparent ‘victim’ – or, perhaps, preferring to see Fico remain in an executive position (prime minister) with much greater impact on policy. As can be seen from the maps here and here, Kiska won in the vast majority of regions – richer and poorer – beating Fico in towns and villages of all sizes. Chart 2 below shows the final result of the election. In light of his spectacular defeat by an outsider, some opposition MPs have called on Fico to give up his post of prime minister. Although such a move is not expected, the government may undergo a restructuring, with the Minister of Culture who headed Fico’s campaign, Marek Maďarič, having already offered his resignation. Nevertheless, the likely fate ahead for the prime minister is that of the once mighty movers of Slovak politics – Vladimír Mečiar or Mikuláš Dzurinda – who sooner or later fell into obscurity. And after reaching its peak in the 2012 general election, Fico’s party, Smer-SD, is set to decline with him. Smer’s gradual decline, however, does not automatically translate into support for any particular party. Radoslav Procházka is not the first politician with ambitious plans to rally Slovakia’s incoherent centre-right, although his strategy of establishing the structures of his new party from the local and regional levels seems somewhat more promising. While the symbolic gesture of giving up his parliamentary mandate may have earned him some admiration, he has also sacrificed a substantial part of the media coverage that comes with being an MP. And while Procházka will undoubtedly work hard to present a viable alternative to Smer-SD for the centre-right voter, there still remains a conspicuous lack of a serious competitor to Fico’s party from the left side of the political spectrum. Ultimately, Kiska, who will be inaugurated as the new Slovak president in June, has promised to unite Slovakia’s citizens, as well as to make politics ‘more human’. While these are indeed noble goals, the situation he finds himself in is rather unfavourable. Despite having a stronger democratic mandate than the incumbent president Ivan Gašparovič enjoyed in both of his terms, Kiska’s lack of support in parliament and the large potential for conflict with the ruling party spell out uncertain times ahead. Whether Slovakia’s political environment will become more turbulent, and who, in political terms, Slovaks have really elected as their president, thus remain to be seen.